The initiative, born as a joint activity between ICMAB and Illustraciencia, within the programme "Yo ilustro la ciencia" and the "Setmana de la Ciència", aimed at enhancing the interaction between both communities, in order to encourage the illustration of the scientific research produced, and to get to know the needs from each sector. 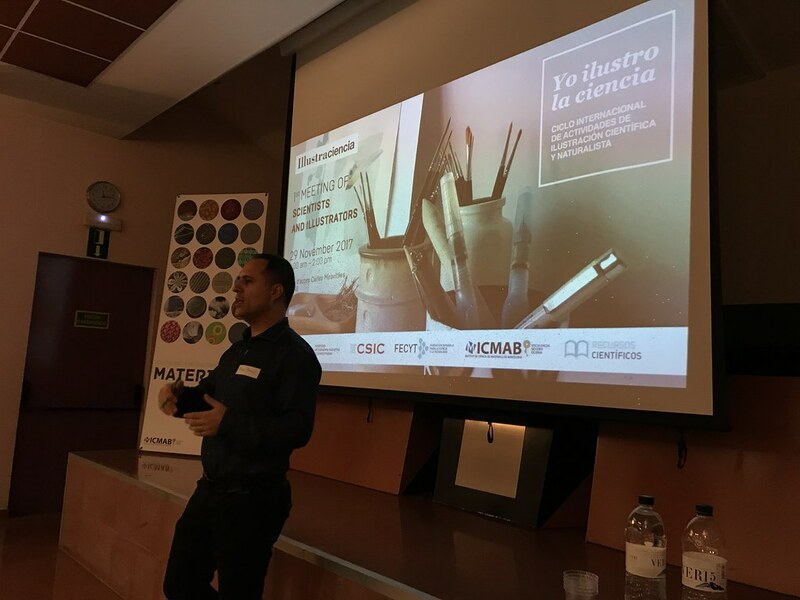 The program included a short presentation of ICMAB by Anna May, Communication Officer of the Institute, followed by a presentation of Illustraciencia by Miquel Baidal, its founder. Roc Olivé, scientific Illustrator specialized in paleoart gave a talk on scientific illustration, and the techniques and topics that one can use. He claimed that paleoart is not that easy to illustrate, because sometimes, from only a few bones, one has to imagine the whole dinosau. In additon, the whole picture may change when science discovers more parts of the skeleton that prove otherwise. After Roc, the scientific illustrators could present their work in a 3-minute flash-talk, which led then to a debate between the two communities moderated by Miquel Baidal. Some of the topics discussed were the deadlines for the illustrations, the cases in which scientists do need the help of a illustrator/designer (covers, branding, poster design, illustration for outreach articles, etc). Everyone agreed that "one good illustration can be used multiple times, one bad illustration, only one"! The meeting continued with a dynamic networking session until 2 pm. As a result of the meeting, contacts have been made and gathered, people have shared ideas, and for sure some of them will turn into real projects in a near future! If more meetings are being held, we hope that even more scientists and illustrators will join. Thank you all for your participation and enthusiasm! Looking forward to further editions!